The latest Pew Research/National Journal Congressional Connection poll, sponsored by SHRM, conducted Sept. 16-19 among 1,005 adults, finds that Republicans, in particular, admire politicians who stick to their positions (62%) over those who compromise (33%). Although independents are more divided on the question, a majority (53%) says they favor leaders who do not compromise; four-in-ten independents (40%) say they most admire leaders who compromise. The balance of opinion is reversed among Democrats; 54% of Democrats say they prefer politicians who compromise with those they disagree with, while 39% say they prefer politicians who stick to their positions without compromising. 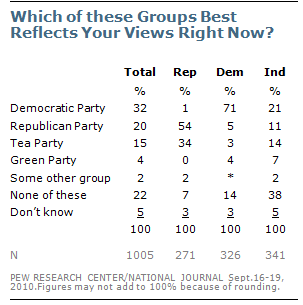 About a third of Americans say the Democratic Party (32%) best reflects their views right now; 20% say the Republican Party does, while one-in-seven (15%) say the Tea Party does. Just 4% say the Green Party and 2% mention another group; fully 22% say that none of these represent their views. There has been little change in responses to this question from when it was asked in April. Republicans and independents who lean to the Republican Party are more likely than others to say choose the Tea Party as best representing their views. About a third of Republicans (34%) say this; by comparison, 54% of Republicans choose the GOP. Both those who identify more with the Tea Party and those who identify more with GOP strongly support Republicans over Democrats across a number of issues. For example, among Tea Party identifiers, 70% say Republicans would do a better job than Democrats dealing with taxes; this compares with 73% of those who say the GOP best reflects their views. However, those who say the Tea Party best represents their views do differ from those who say the GOP best represents their views in some key ways. Tea Party affiliates have substantially less appetite for political compromise: About seven-in-ten (71%) of those who identify with the Tea Party say they most admire politicians who stick to their positions; a smaller majority (59%) of those who say the GOP best reflects their views say this. And those who identify with the Tea Party also are far more likely to say that allowing the George W. Bush tax cuts for income above $250,000 to expire at the end of this year would hurt the economy; 72% say this, compared with 53% of those who identify more with the Republican Party. 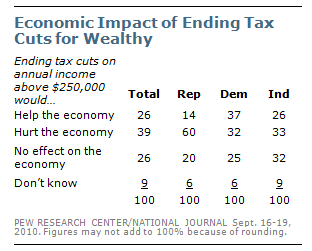 Nearly four-in-ten Americans (39%) say that allowing Bush-era tax cuts for the wealthy to expire at the end of this year would hurt the economy, while about a quarter each say this would help the economy (26%) or have no effect (26%). The latest Congressional Connection poll finds that Republicans are much more likely than Democrats or independents to say that ending the tax breaks for annual income above $250,000 would hurt the economy. Six-in-ten Republicans (60%) say this, compared with 32% of Democrats and 33% of independents. The public remains divided on the question of which party can do a better job dealing with the economy: 38% say Republicans can do a better job in dealing with the economy, compared with 37% who favor the Democrats. 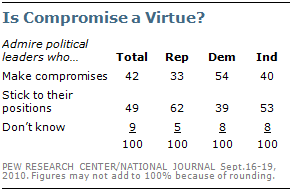 Views are divided on several other key issues, though Republicans have an advantage on dealing with immigration. According to the latest Pew Research/National Journal Congressional Connection poll, sponsored by SHRM, conducted Sept. 16-19 among 1,005 adults, 39% say Republicans would do a better job dealing with immigration, while 32% choose Democrats. In February 2008, during the final year of George W. Bush’s second term as president, Democrats had a large advantage on the economy. At that point, 53% chose Democrats on this question, while 34% chose Republicans. Two years later, the parties were largely even: 41% chose the Democrats in February 2010 and 38% chose the Republicans. There has been little change in opinions since then. On immigration, Republicans have held a slight edge since May. Prior to that, pluralities either favored Democrats on this or the two parties were essentially even. Among independents, 38% currently say Republicans can do a better job on immigration, while 26% say Democrats can. Republicans have drawn even with Democrats as to which party can do a better job “taking steps to make the Social Security system financially sound.” Roughly a third (35% each) say Republicans or Democrats would do a better job on this. Democrats have long had the advantage on this issue. In September 2006, 46% said the Democrats could do better in making Social Security financially sound, while just 26% said the Republicans. The public also is divided over which party would better handle reforms of the Medicare system: 38% say Democrats and 33% say Republicans. Four-in-ten say Republicans (40%) would do a better job in dealing with taxes, about the same as the 34% that say Democrats would do a better job on this. Independents largely reflect the public as a whole: 36% choose the Republicans and 30% choose the Democrats. In August 2009, the two parties were rated about even on taxes. 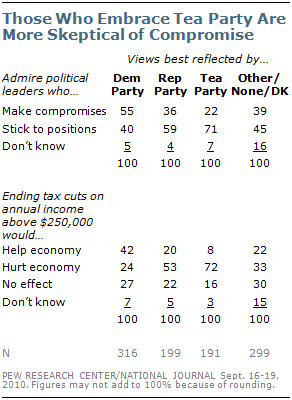 In February 2008, 49% said Democrats could do a better job on taxes, while 37% said the Republicans could.